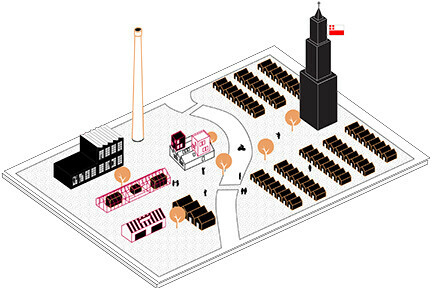 In the following years Eneco’s closed factory area Lage Weide in Utrecht will be transformed into a dynamic place in the city, where companies and students can develop and test new energy transition applications: the Eneco Energy Campus. Aron Bogers (architect) and Rutger Büch (Circelstad) support Eneco by shaping this transformation. In the following months Rutger and Aron, together with Eneco, will engage in conversation with parties who can help make a difference. Together with potential co-makers they are exploring the chances of the Energy Campus and visualize the potential of this special place in the city. Already there’s a lot of interest. On the 9th of September Eneco will receive a delegation of the City of Utrecht, the Ministry of Economic Affairs and a couple of companies that might be interested in settling at the Campus. The ambitions are high, the targets are clear. The Eneco Energy Campus has to become an environment where ‘the new world’ becomes visible and where clients can see the newest products and developments. The venue in Utrecht is wide and inspiring. The atmosphere is open: anyone who wants to contribute to delivering (and dividing) the new energy for 60.000 Eneco clients can participate. By transforming Lage Weide, Eneco says goodbye to the old world of coal power plants, oil platforms and gas extraction and focusses fully on the new world. The world of solar energy, wind energy, biomass and earth heat. Like no one else CEA Jeroen Haas sees the social revolution that comes along with this transition of energy. Together you create a sustainable and healthy living environment. “People want to be in control. In the future energy companies should help people to provide in their own need for energy. At the Eneco Energy Campus we together shape the new world. What will your contribution be?